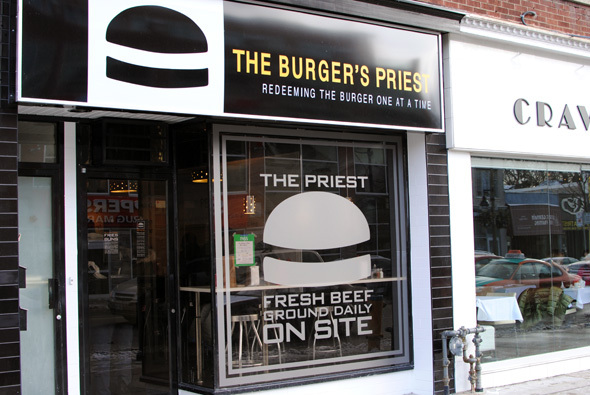 The Burger's Priest has, without any irony, developed a pretty ardent cult following. Opened in the summer of 2010 , Shant Mardirosian's local paean to flat top franchise In-N-Out has conquered Toronto's burger scene in just one short year. 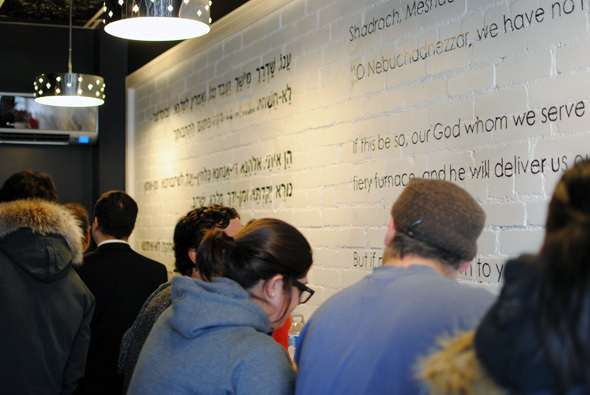 Openly aping In-N-Out's fresh, never frozen beef philosophy (also: the franchise's secret menu), the Priest has attracted a steady stream of burger fans from across the GTA willing to make the pilgrimage to Queen and Coxwell. The fast food restaurant caused a local frenzy when news broke it would be opening a more subway accessible second location on Yonge Street north of Lawrence Avenue (you'll still have a bit of a walk from the station). After some initial delays, the highly anticipated expansion debuted roughly a week ago, and it hasn't taken long for the new Priest to attract a flock. Two days after opening, a weeknight visit finds the restaurant so full we can't even squeeze ourselves into the door. From afar it looks as though the small storefront is trying to set a Guinness World Record for most patrons rammed into a single hamburger joint. A return trip on Friday afternoon proves more manageable. There is still a steady stream of customers filling three quarters of the room, featuring an eclectic mix of business types who've made the lunch trek from Sheppard or Eglinton, and local kids in school uniforms. Substantially larger than the Priest's original restaurant, the uptown expansion projects much of the same spartanism as its predecessor. 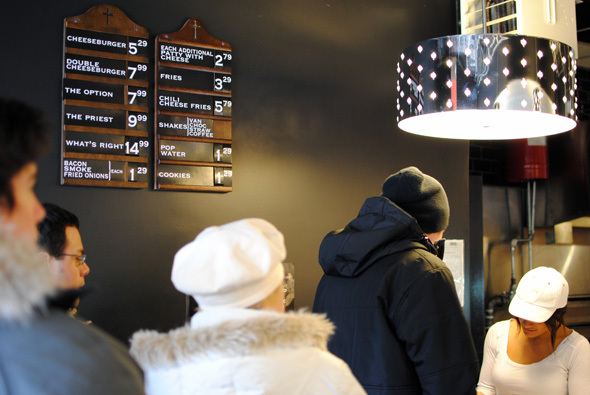 A plain white counter wraps around two sides of the long and narrow room, seating roughly 15 patrons on bar stools â a modest but relatively spacious improvement over the decidedly take-out targeted trappings of the Queen St. locale. The casual, contemporary vibe is accentuated with a black tin roof and white, exposed brick accent wall that provides stark contrast to the dark ceiling and paint. Perhaps the most glaring upgrade however is functional rather than aesthetic: the new location has washrooms. For customers to use. Hallelujah! We order one Priest ($9.99, a single beef patty topped with fried portobello mushrooms and processed cheese) and a Noah's Ark ($11.28, a Priest, slathered in chilli cheese sauce). We pair up our burgers with regular fries ($3.29) and a strawberry milkshake ($4), the drink a new menu offering currently exclusive to the uptown location. The cashier taking our order is friendly enough, but we notice a bit of a kink when she asks if we'd like our meal as a combo despite a lack of pricing for this on the hymnal board menu. This is a minor service nitpick, but indicates that despite a constantly packed house, the nascent expansion is still going to suffer from a few growing pains. I can safely report, however, that the burgers are still very, very good. The signature, freshly ground beef patty is griddle cooked to perfection, slightly pink on the inside, crumbling just slightly and sopping an appropriate amount of juices into the simple white bread bun. Our fried mushroom topping stuffed with cheese is perfectly crispy on the outside, revealing a delicious and gooey blob of dairy with every bite. 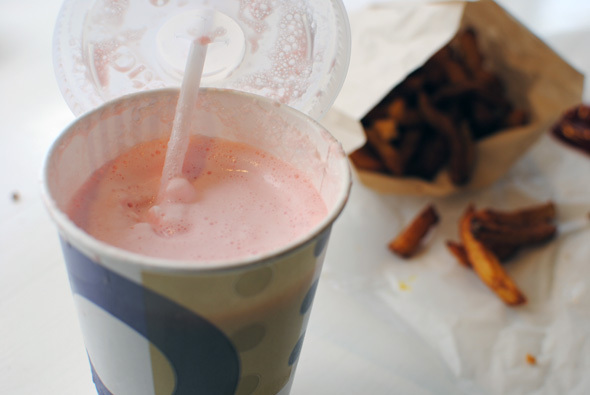 The strawberry milkshake is also an above average offering, served in a no-frills dixie cup and viscous enough that sucking it through the provided straw is no simple feat. It isn't a gourmet shake and has the signature taste of artificial strawberry flavouring â but that's expected and it delivers in the best of traditional diner ways. The fries, however, leave something to be desired. Usually a well seasoned, perfectly crispy treat, the potatoes we get this meal overly cooked on the outside and slightly undercooked on the inside. The spuds aren't atrocious, but they're definitely not good. Certainly they're not up to snuff compared to past experiences at the restaurant. Again, the chewy potatoes should be chalked up to a new location still getting its legs under it. At $33 dollars for two cheeseburgers, one serving of fries and a milkshake, one would hope every experience at the Burger's Priest is exceptional. It's earned more than enough goodwill to earn the benefit of the doubt, so I expect these wrinkles will be ironed out as the new outpost settles in.